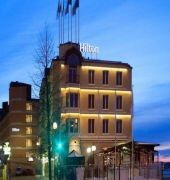 Overlooking the Riddarfjarden waterfront, Hilton Stockholm Slussen Hotel is a four star property, centrally situated in Sodermalm district and a short drive to Gamla Stan (Old Town). 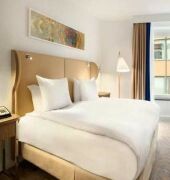 All accommodations feature stylish Swedish decor and are filled with natural daylight. Each air conditioned rooms is equipped with a separate work area with desk and ergonomic chair, LCD TV, mini bar, hair dryer and marble bathroom. 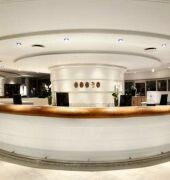 Executive rooms and suites have an exclusive access to the hotel's contemporary Executive lounge. Wireless internet access is available throughout the hotel. 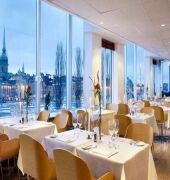 From business brunches to pre-dinner drinks and everything in between, guests can enjoy a variety of Swedish and international cuisine at the on-site restaurants and lounge bar. 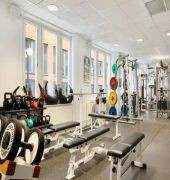 The hotel also features a fitness centre complemented with sauna, exercise classes and personal trainer. Bromma Stockholm Airport is 10 km away.